Twproject support an easy way to refer and link to any “entity” from any descriptive field. 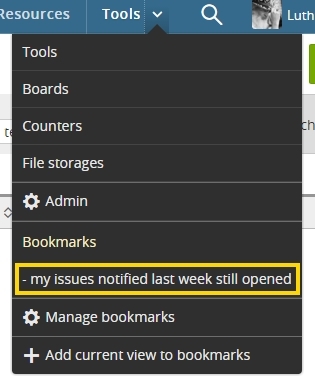 For example, you can link any task, resource or issue from any event in the agenda. You can link any other task from a project description or deliverable. Same from the issue description and so on. Notice in this top part of the task editor on the left that there a task internal “code”, which every saved task has: T#IDAHO#. This code allows you to link to this task editor from every other editor in Twproject. For example, if on any (other) task editor in the “description” or “deliverables” fields you write such code, this will turn into a link. In this way you can cross link any task to any other, and more – see below. 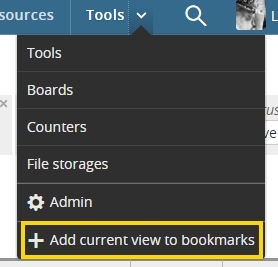 A simple way to get back to a common used page is to record a bookmark. 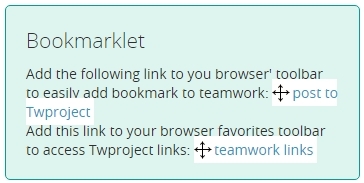 Twproject has a refined tool to manage bookmarks. 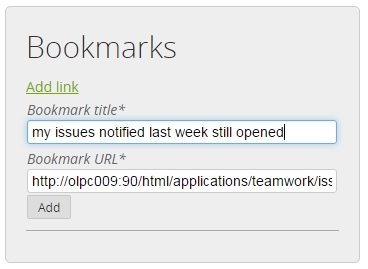 External links can be save as well by adding a bookmarklet to your browser. and drag the link on the browser toolbar. Then go wherever you like and click to add that page to you Twproject menu.